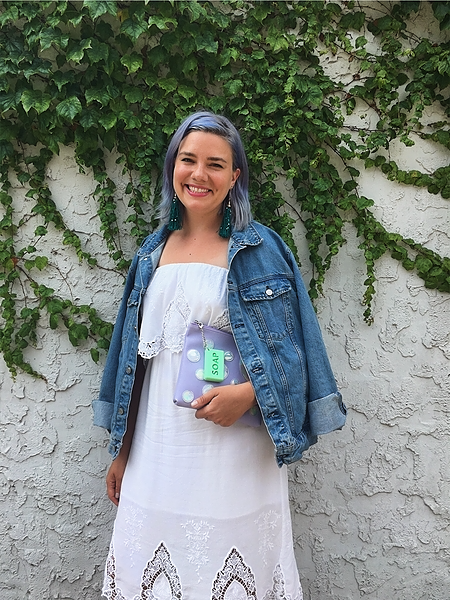 Home » Hand in Hand » What's In Zofia's Bag? The Bag - I'm a huge fan of Studio DIY & their newly launched bag subscription service called Can't Clutch This! that sends you a super cute clutch every month! 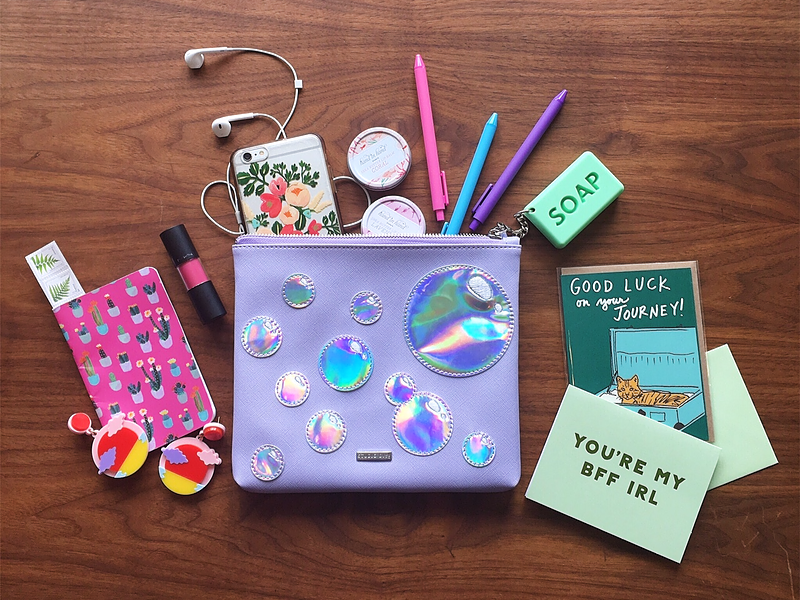 When I saw this month's bag, I couldn't resist the fun holographic bubble details (plus the soap keychain is so us)! Balm - I never leave the house without one (or two!) of our Shea Butter Lip Balms. My favorite for summer is Coral with it's pretty pink tin and bright, citrus-y scent. Lipstick - This formula from MAC feels like velvet on my lips, plus the vibrant pink shade is so much fun! Cactus Notebook - You never know when a great idea will strike (+ it's more fun than using my iPhone)! Cards/Pens/Stamps - Sending cards is my absolute favorite thing to do, so I always carry a few spare cards, pens + stamps so I never miss an occasion to celebrate! Local shops like Occasionette and Paper Source are my go-to card stores. Earrings - I feel naked without my statement earrings! I even carry an extra pair with me just in case I run out the door without them. These are from one of my favorite jewelry designers, Jennifer Loiselle, who created these exclusively for ban.do. Phone + Headphones - I am a walking commuter and love to listen to podcasts as I navigate around the city (usually with my pup Winston)! Currently, I'm listening to How I Built This, Start Up and S-Town.